Last week I went to a pretty fantastic show at Rockwood Music Hall. The space is tiny, the sound is not. I saw Chris Thile & Michael Daves, a duo that’s just put out an album of bluegrass covers called Sleep With One Eye Open. I’ve written a couple of album reviews in my day. But I don’t really feel like writing one now, so I’ll just say it’s super good. Anyway, as the guys were walking to the stage, Chris Thile smacked me in the knee with his fancy mandolin case. You know how most people’s legs kick out when their reflexes are tested? My leg instead told my brain to call Thile a very specific and not-very-nice name. Sad Shibow: Making Famous Musicians Feel Uncomfortable Since Birth. 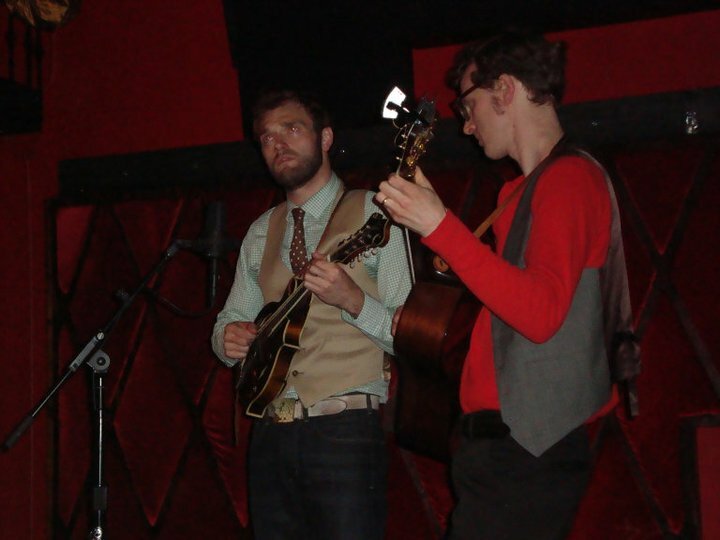 Chris Thile and Michael Daves. Oh, did I mention my flash randomly went off and probably blinded these two during the "serious song?" I am the worst. I don’t think he heard me. The dude I was with claims he did, but I’m pretty sure he was just trying to stir up trouble for his own amusement. I hope. Maybe? Anyway, we didn’t stick around after the show to meet the guys/find out if they hated my guts. Instead, I went home, nursed my [perfectly fine] kneecap and decided to bake my embarrassment away. Worst segue ever, right? I just really liked that story, even though I probably shouldn’t. Sorry! 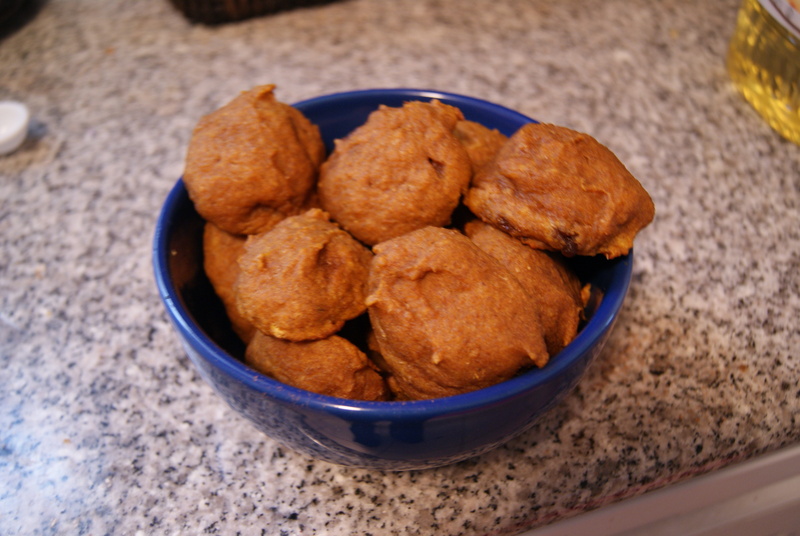 Ok, so, I still have, like, nine cans of pumpkin puree left over from Thanksgiving. While it would be completely safe/acceptable to wait until this Thanksgiving to use one or all of them, I’m not going to wait that long because I don’t feel like it. I do what I want. I call musicians names and stuff. I do what I want. And I want to make pumpkin cookies. When I saw this recipe for them, I knew I had the ok. Plus, the weather here has been deeeeepressingly cold and wet, so my brain’s not completely sure of the season. Now, since summer is supposedly coming and since I’m trying not to go from Sad Shibow to Flabby Shibow, or Sad and Flabby Shibow, I decided to tweak this recipe a little to mayyyybe up the health profile I little. I know, lame, dumb, blahblahbutterblah, but it will still taste amazing. Pumpkin on its own contains an enormous amount of nutrients, including fiber, vitamin E and beta-carotene. But I’m not your health teacher. I’m your sad baking friend, so I’ll just stick to what I know. Have the oven preheated to 350°F. 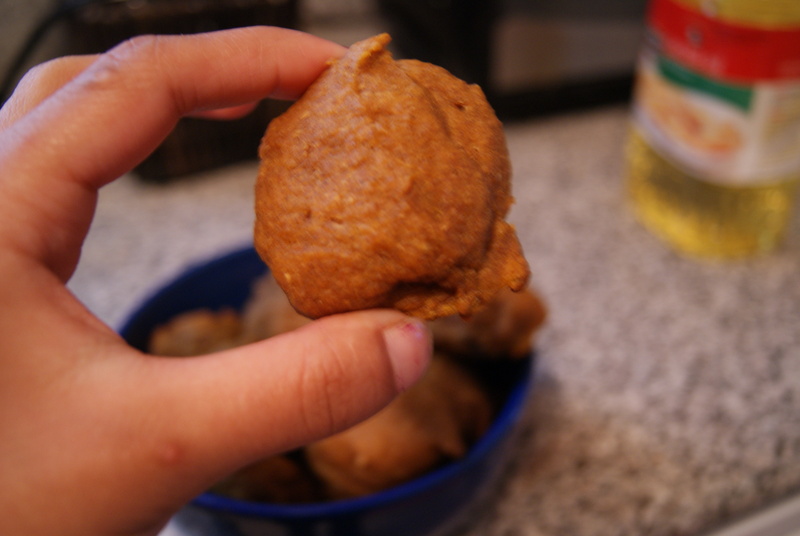 In a large bowl, mix together the flours, baking powder, cinnamon, baking soda, salt, nutmeg and cloves. In a separate bowl, stir together the sugar, syrup and oil until fully combined. Stir in the pumpkin puree, egg and vanilla. Slowly fold the wet ingredients into the dry ingredients, and pop the batter into the refrigerator for about half an hour. I like to tell myself that I had a bowl full of multivitamins for breakfast this morning. Boom! One bite of these had me wishing I were prepping for a Thanksgiving feast. Then I glanced out the window and wept, because it really is pretty crummy out. Eating my seasonal depression away? So no, even pumpkin cookies won’t psych me into thinking that it’s autumn and it’s supposed to look like death outside. But they will keep me company until the sun comes out. And I don’t have to feel too bad about indulging in these, since they actually are delicious, moist and not terribly bad for me. And I’ve got tickets to another Glen Hansard show this week, so I can continue my reign of unintentional awkwardness. Hooray. I’m great.